General Apple and Mac desktop news is covered in The Mac News Review. iPod news is covered in The iNews Review. PowerBook or iBook mini in Apple's Future? Motion Hacks Bring PowerBook to Life: Is Motion the Mouse Replacement? "Who's responsible for pioneering the biggest shift in PC technology since the punch card gave way to the magnetic disk? "ThinkPads were red hot, but IBM was still a corporate brand for corporate users. College kids and aspiring hackers wanted portables, too: They bought the Apple PowerBook. "The Apple PowerBook 100 spawned countless innovations, the most notable being moving the keyboard to the back of the machine and making room for a trackball front and center. 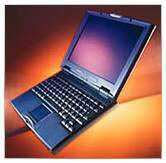 In 1995, the PowerBook 500 offered the first true touch pad, expansion bay, PC Card slot, and more. But it was the PowerBook 500's curvy case that really turned heads, proving that portable computers needn't look like shoe boxes any more. "In its early '90s heyday, the PowerBook owned a crushing 40 percent of the portable computing market, until the rest of the industry figured out how to do the same thing, only cheaper." "I need this in a sub-PowerBook from Apple. No need for the full 'POWER' if that is what you want to call it, even of the 12" size/weight on the road. (sometimes still using a 2400 which is a sight form factor edge but that is getting old!!) Seems that this Sony would give me nearly everything I need in a great package - except the Mac OS. (I refuse to go over to the dark side!!!)" "Scientists are working on ways to ensure laptops can stay powered for an entire working day. "Building batteries from new chemical mixes could boost power significantly, say industry experts. "The changes include everything from the way chips for laptops are made, to tricks that reduce the power consumption of displays. "Ever since laptops appeared the amount of time they last between recharges has been a frustration for users." "That's considerably faster than today's Li-ion rechargeables which can take 1-4 hours to reach 80 per cent capacity, and even longer to fill completely. "Toshiba also claimed the new cell offers a greater longevity than today's Li-ion batteries, losing only one per cent of its capacity after 1000 charge cycles, according to the results of its own charge-discharge testing." "With the mouse entering its fifth decade, it could perhaps be on the verge of retirement - at least if a combination of Apple Computer engineering and the work of enterprising hackers bears fruit. "Introduced with the company's most recent round of PowerBook updates, Apple's Sudden Motion Sensor is designed to detect any strong vibration or sudden motion - such as the laptop being dropped from a desk - and park the drive heads, lessening the chances of damage to the drive. But the motion sensor does more than just notice sudden movement: It can be used to determine the angle the PowerBook is tilted at in any direction, along with the velocity at which the computer is being moved. "Enterprising hackers have discovered that because the new motion sensor returns reasonably accurate measurements to Mac OS X, it can be used to do some cool tricks, from realigning an image in a window so it always points up, no matter what angle you hold the laptop at, to controlling what's playing in iTunes - rock the machine backward to go to the next track, forward to play the previous one." "You may have seen the IBM ads showing off its brace technology for notebook computers, meaning that if you drop the notebook it 'braces for impact.' Apple has introduced a similar technology on its latest range of PowerBooks called the Sudden Motion Sensor (SMS), which can sense both vibration and sudden motion and performs similar damage limitation tasks when it thinks the notebook is being dropped. "SMS is not limited to being a safety measure, however, with hackers finding out they can use the tech to create a range of different and unintended applications. This discovery was made by one Amit Singh, an IBM researcher, who looked into the motion sensor when writing a book about OS X. Mr. Singh's work has helped hackers experiment with the motion sensor and produce a range of games and new ways of interfacing with a notebook computer." "At first sight, the smallest of Apple's PowerBooks does look too small to get any real work done. "However, as a trip through the western U.S. with my daughter's 12in iBook proved, that diminutive screen is no impediment to getting stuff out the chute." "Let's start our look at Apple's latest 15-inch PowerBook, with a glance back at what the company offered in the same size just one year ago. "In late January, Apple updated its PowerBook line - and I promptly snapped up a new 17-inch model. But before doing so, I seriously considered the 15-inch model, which for most people offers the best blend of performance and portability. In the end, the larger screen won me over. But when Apple offered a new 15-inch PowerBook for review purposes, I readily agreed to try it. "So what has a year of progress brought?" Ask Johnny Appleseed has posted comparison data between 14" iBook G4/1.33 GHz with Combo drive (M9627LL/A) and 15" PowerBook G4/1.5 GHz with Combo drive (M9676LL/A). "...in processing ability the PowerBook is slightly ahead. The PowerBook has a much faster graphics card. The hard drive on the PowerBook is moderately faster. The iBook gets much better battery life." "So in processing ability the iMac is moderately ahead. The PowerBook has a moderately to significantly faster graphics card, depending on the task. The hard drives are pretty evenly matched, with the nod going to the iMac." PR: Panasonic Computer Solutions Company, the leading provider of ruggedized portable computers in the U.S., has introduced what it claims to be the industry's highest-performance rugged notebook, the 2 GHz Toughbook CF-51. The CF-51 is based on Intel Corporation's revolutionary new Centrino mobile technology platform, and includes the Intel Pentium M processor 760 at 2.0 GHz, a full magnesium-alloy case, an internally shock-and-drop resistant 80 GB removable hard drive, 1 GB Ethernet NIC 10/100/1000 support, Intel Pro/Wireless 802.11a/b/g connectivity and a 15-inch UXGA (1600 x 1200 pixel) TFT active-matrix color display mounted in a shock-and-vibration hardened encasement. "The Toughbook CF-51 is much more than just another new, faster-CPU'd face on the rugged computer scene," said Panasonic Computer Solutions Company President Rance Poehler. "The CF-51 does have the fastest CPU clock speed in its class, but the main reason for its superior overall system performance is the Panasonic engineering expertise that enabled us to rapidly Second Generation Centrino™ mobility platform and 533 MHz FSB CPUs into our computers. "Our chief competitors are still using 400 MHz bus CPUs and first-generation Centrino™ technology and that - even more than the difference in raw clock speed - is why they're falling behind in every crucial performance category." 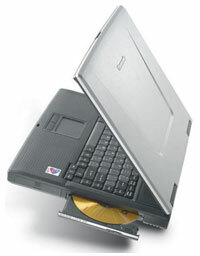 Poehler also noted that the new Toughbook's hard-drive implementation significantly expands the definition of the term "ruggedized computer." "With the 51 we have expanded the ruggedization process out of the box and applied it to specific individual components which are likely to be repeatedly removed and reinstalled," he said. "The Toughbook CF-51 was specifically designed for customers with critical data-security requirements such as government employees and Enterprise executives who are required to pull their hard drives whenever they leave their computers unattended," he said. "They - and we - were rightly concerned about what might happen when a bare drive is accidentally dropped or subjected to some other shock. Our response to those concerns is the Toughbook's proprietary hard drive, which can withstand a four-foot drop to a solid surface. "Some of our competitors may have hard drives that will take that kind of impact when they're safely tucked up in the computer case, but none of them have a bare drive that can survive that kind of abuse. The reason none of our competitors have that rugged a drive is simple. None of our competitors manufactures their own drives. Panasonic does." 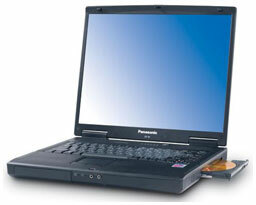 The only core manufacturer in the rugged computer market, Panasonic designs and manufacturers such durability optimized Toughbook components as cases, hard drives, display screens, system boards, advanced heat-transfer systems and dirt and moisture seals. The Toughbook CF-51JBRDCBM is powered by an Intel Pentium M processor 760 running at 2.0 GHz, a 533 MHz front-side bus and 2 MB L2 cache. It ships standard with 512 MB of DDR RAM (expandable to 2 GB), a 15" TFT active-matrix UXGA display with 64 MB VRAM, an 80 GB hardened hard drive, a DVD/CD-RW combo drive which can be user-replaced with a second battery for extended runtime of up to seven hours, a modular floppy drive, wired, wireless and analog modem support, and Windows(R) XP Professional Service Pack 2. For more deals on current or recently discontinued models, see our Best PowerBook G4 Deals, Best iBook G4 Deals, Best PowerBook G3 Deals, and Best iBook G3 Deals.